In January 1985, when my mother was consulting for several Italian wineries from our home in Denver, she was featured as Bon Appétit magazine’s “great cook” of the month. The food editor was a good friend, and upon sharing with my mother that it was difficult to find accomplished home cooks for this section, Mamma volunteered with enthusiasm; she was already known for her dinner parties. The resulting seven-page spread featured eight original Italian recipes that showcased her roots, noting that, “Almost everything is made ahead of time because she wants to enjoy her own party.” Not to mention she had twin daughters not yet a year old at that point and was also working full time. 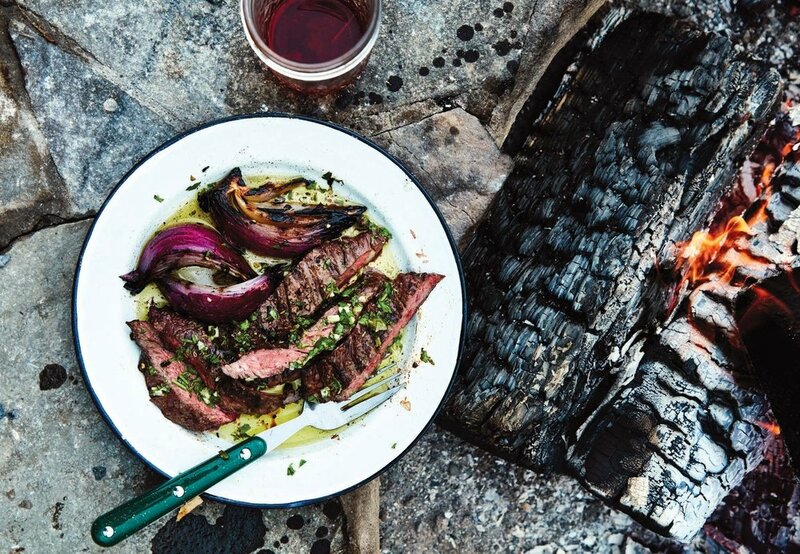 When I’m camping, I also want to relax at dinner, which is why I love this easy, bright sauce with high-voltage flavor (it’s been passed down for generations in our family). It’s the perfect complement to nearly any entrée or side dish, especially skirt steak. The affordable cut cooks fast on the grill, yielding a crispy crust and juicy interior. Leftover steak can be used for sandwich, taco, and quesadilla fillings. Keep extra salsa on hand for spreading on Charred Bread, or spooning over coal-baked potatoes , eggs, and fish. If you’re using capers packed in salt, rinse them first. Fire the grill to high heat and position the grill grate as close as possible to the coals or pile the coals high under the grate to maximize the steak’s proximity to the fire. Remove the steaks from the cooler and pat dry with a paper towel to eliminate moisture on the surface and ensure a crispy crust. Sprinkle both sides with the pepper. Place the steaks over the hottest part of the fire. Using long tongs, flip the steak every minute or so for even cook­ing; the cooking time will vary depending on thickness. Look for an evenly caramelized and browned outer crust to check doneness. Slight char is okay but don’t let the crust burn! Use a thermometer to check that the internal temperature of the thickest part of the steak is between 125° and 130°F for medium-rare to medium. You can cook longer for medium-well or well-done, though it will make the steak chewier. Transfer the steak to a cutting board and let rest for 10 minutes so the juices can redistribute. Slice the steak against the grain into 1⁄2-inch slices. Serve directly from the cutting board. Stir the top layer of oil into the salsa verde just before serving and let campers add it to their steak directly from the jar. Store leftovers in an airtight container, chilled, for up to 3 days.